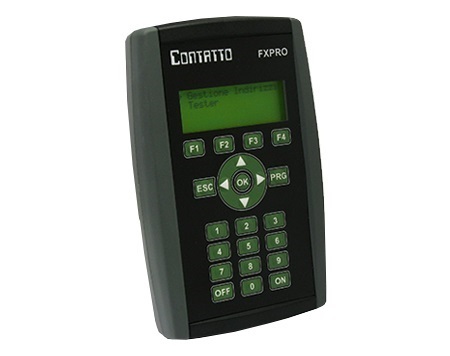 FXPRO2 is a portable instrument for the address assignment to Contatto modules; also, it allows to perform diagnostic functions and in particular the test of the Contatto bus line in order to check for its correct operation. 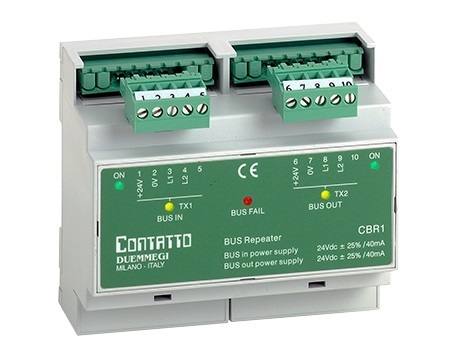 CBR1 module allows to double the total lenght of the bus line. One or more repeater can be used to enlarge the bus line. 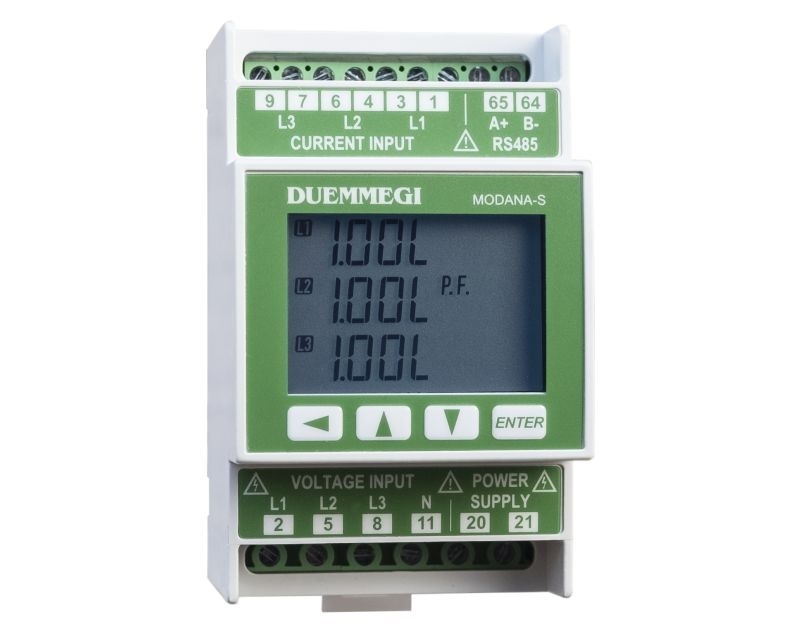 Single Phase Switch mode Power Supply 40-80 W are available in modular version to supply the system or some devices (MODGSM, METEO, Touch Screen.). 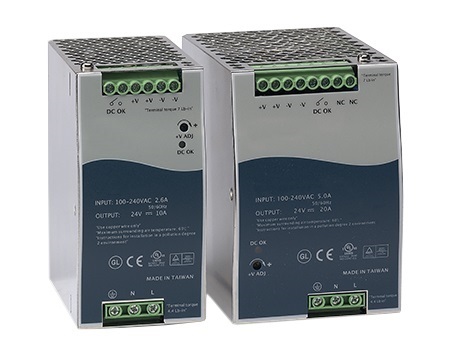 These power supply are modular case and equipped with: Over temperature (OTP), over load protection (OCP), short circuit protection, Fuse and EMI filter arranged inside. 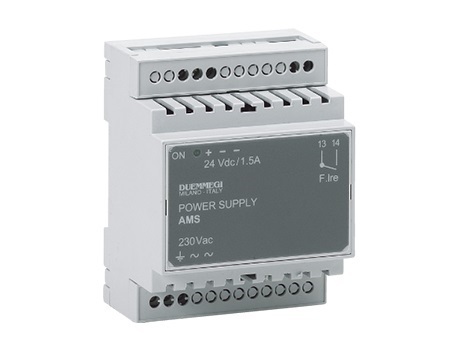 Single Phase Switch mode Power Supply are avaiable to supply the system. 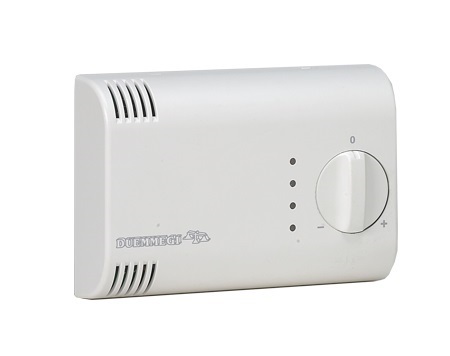 These power supply are equipped with: Over temperature (OTP), over load protection (OCP), short circuit protection, Fuse and EMI filter arranged inside. 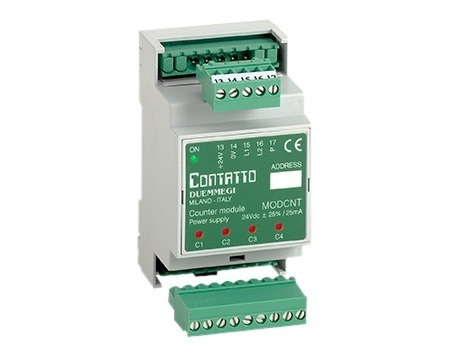 MODCNT module allows to transmit, through the Contatto bus, the values of 4 counters implemented in the module itself; each counter is incremented by proper pulses applied to the relevant input; typical applications of this module, when combined to special meters, are energy measurement systems, water consumption systems, etc. 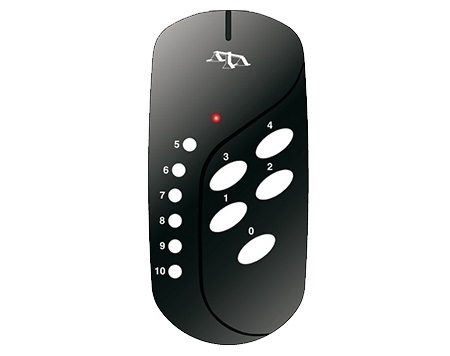 The system was specifically developed for access control managed by the new enhanced controller MCP XT. This system features a ModCA module , a transponder reading unit TPR/T (with the related panel that can be mounted on the frame for 503 box of the preferred manufacturer) and an optional second antenna. 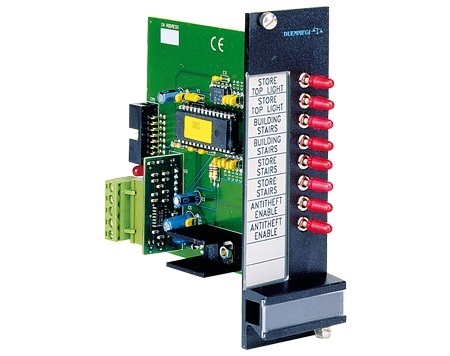 ModKB module has been specially developed for the connection to third-party numerical keypads using WIEGAND standard protocol. 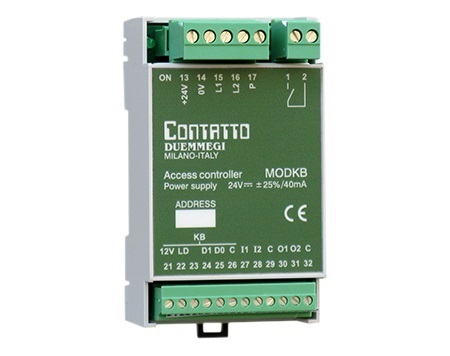 ModKB module interfaces, through MCP XT controller, to the well tested Contatto world, thus integrating it with an easy to use PIN code based access control system. OUT OF PRODUCTION - ModGSMIII module allows to receive information from Contatto bus and to send commands using a standard GSM portable phone. The way to exchange information with the Contatto bus is based upon the SMS messages. 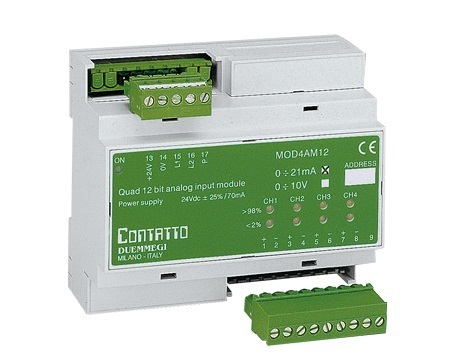 ModDALI8 module manages, through the Contatto bus, 8 lines of 16 DALI devices per line, then a total of 128 per module. ModDALI8 is a multi-line device featuring DALI broadcast commands, which means commands addressed to all the devices on that line regardless of whether or not they have an address; in this way the addressing and the assignment of groups is not needed; this greatly simplifies the setting up and, above all, the maintenance of systems using the DALI technology. 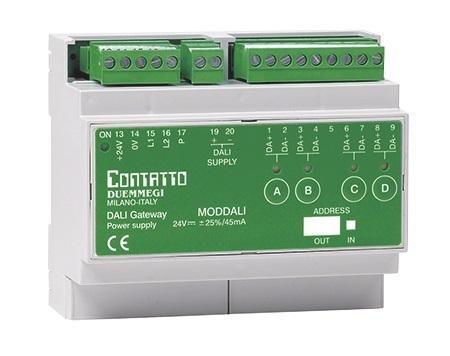 ModDALI module allows the interfacing between Contatto bus and DALI bus for the management of the lighting. 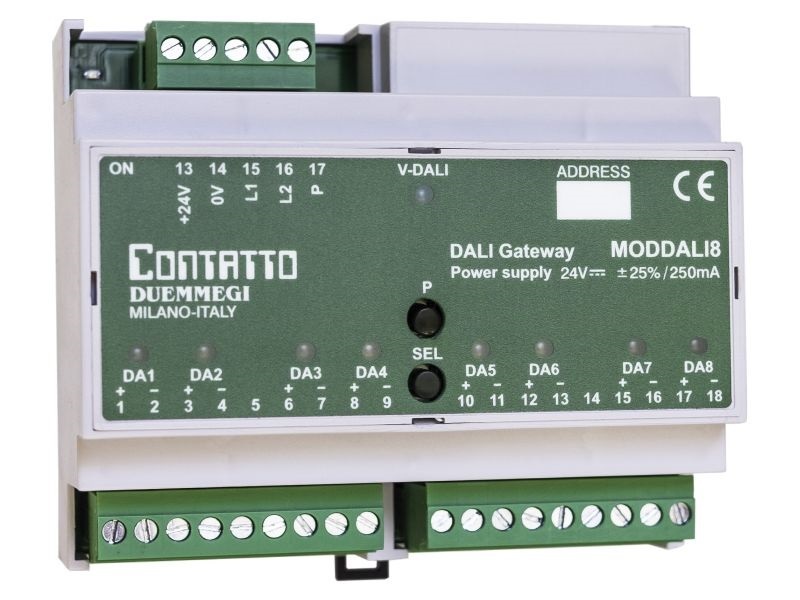 ModDALI module features 4 DALI lines upon it’s possible to connect up to 32 devices for line; an optional version for 64 DALI devices on 2 lines is available. 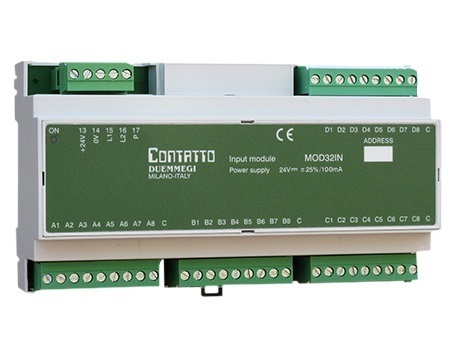 ModDMX module allows to handle, through the Contatto bus, up to 32 DMX devices. 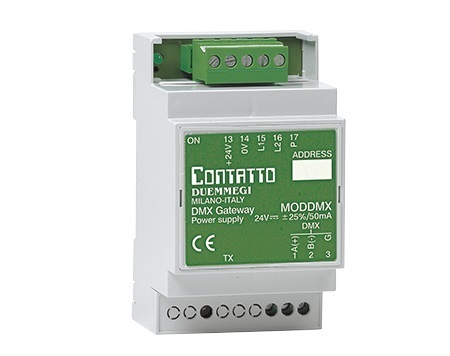 ModDMX module makes possible the communication on 64 of the 512 DMX channels allowed by this protocol and it can be successfully employed in professional lighting applications such as theaters, disco clubs, architectural lighting, etc. 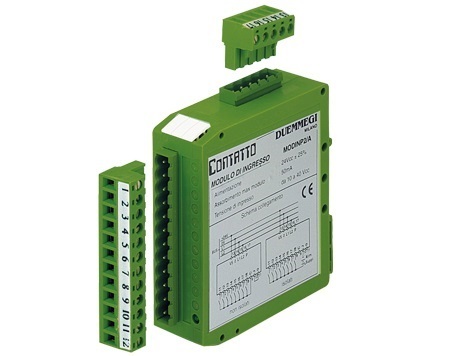 ModAM2 analog input module allows detection and processing of two input signals; these can be configured via bus, independently, for voltage 0÷10V, current 0÷20mA, temperature with PT100 sensors, temperature with PT1000 sensors and temperature with NTC sensors. 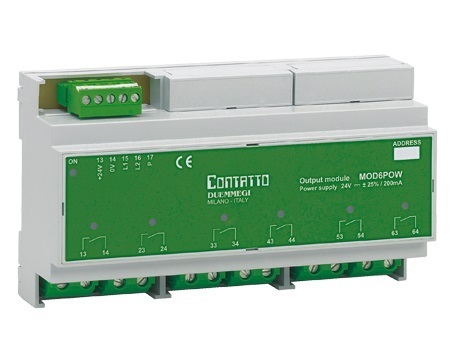 The couple of modules ModANA-M and ModANA-S allows the measurements of several electrical parameters of a three-phase or single-phase network. 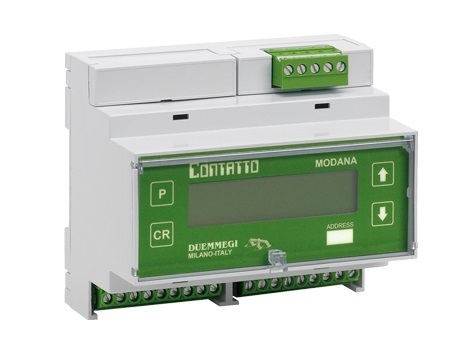 ModANA-M module interfaces directly to the Contatto bus, thus making the measurements immediately available and easy to use. The measurements are also showed on the front panel of ModANA-S by a back-lighted LCD display. MOAN/U modules allow transmitting analog signals through the bus system. Both 0 ÷ 10V and 0 - 5V outputs are provided at the terminal block. 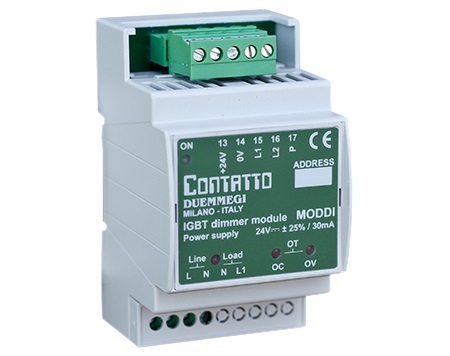 Mod32IL modules allow to transmit, through the Contatto bus, 32 ON-OFF signals derived, e.g., from push-buttons, limit switches, proximity switches, etc. A red LED on the front panel for each one of the 32 inputs reports the related status. 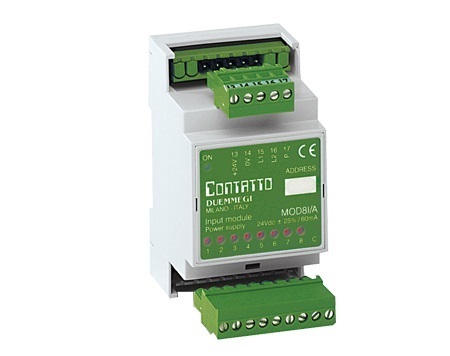 MOD8I/A modules allow to transmit, through the Contatto bus, 8 ON-OFF signals derived, e.g., from push-buttons, limit switches, proximity switches, etc. 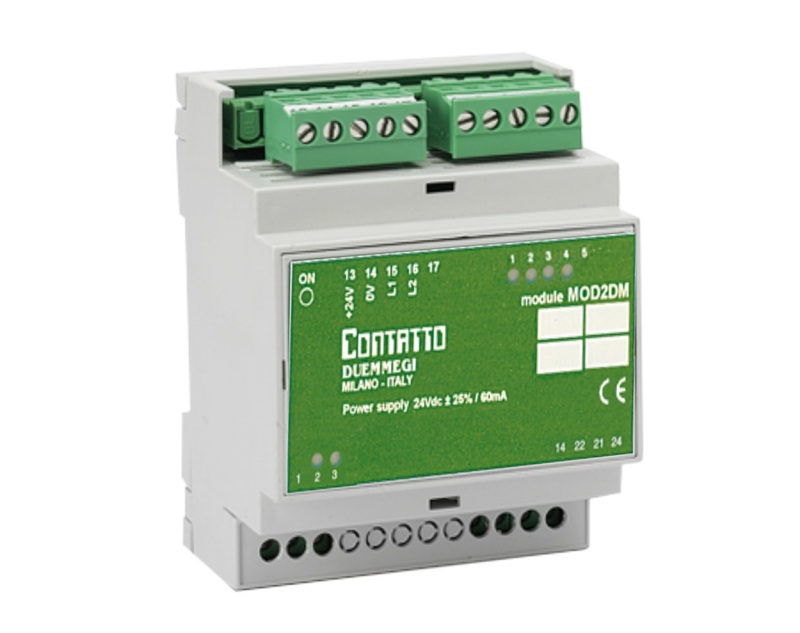 Mod4I/S modules allow to transmit, through the Contatto bus, 4 ON-OFF signals derived, e.g., from push-buttons, limit switches, proximity switches, etc. 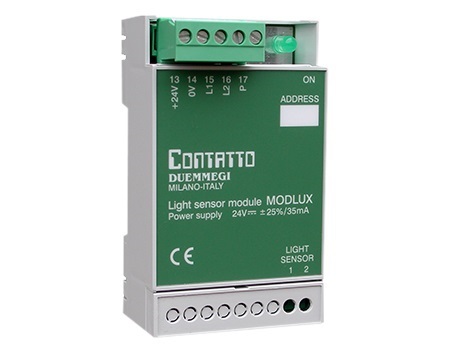 MOD8IL module allows, through the Contatto bus, the acquisition of 8 ON-OFF signals and the driving of 8 LEDs. Under request, it is available a polycarbonate panel with 8 membrane pushbuttons and 8 integrated LED (MOD8IL/T). 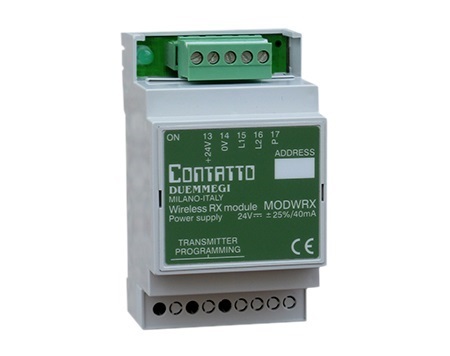 MODWRX module allows to handle, through the Contatto bus, up to a maximum of 8 wireless ransmitters with ENOCEAN technology. MOD8R modules have 8 built-in relays with 1 changeover contact each one. They have 9 pole terminal blocks for the loads connections, 8 red LEDs on the front panel to signal the output status and a green LED to report the module’s power-on condition. 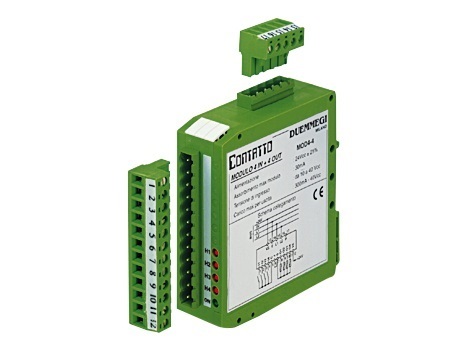 MODREL2 output module features 8 relays for the control of ac and dc loads such as relays and lamps. Mod6POW output module features 6 power relays for single phase loads; the insulation spacing between each output and the other ones allows this module to be suitable for the connection to single phase loads supplied by a 3-phases 400Vac network; each output of the module features the normally open contact of the related single phase relay. 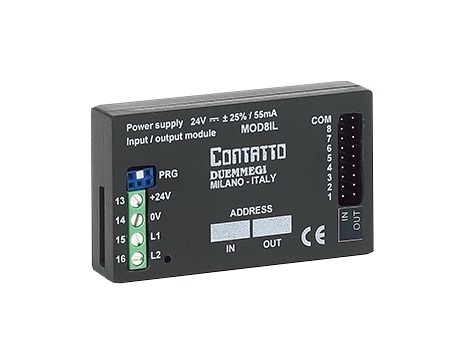 ModDI dimmer output module allows the brightness regulation, through the Contatto bus, of loads up to 500W. 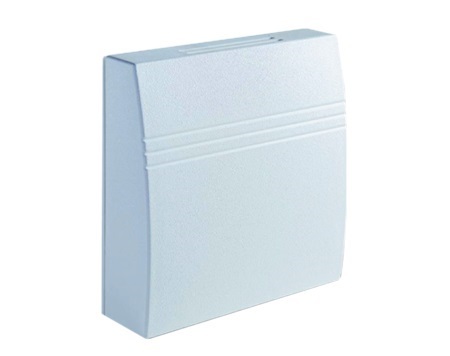 It is particularly suitable for driving electronic transformers. 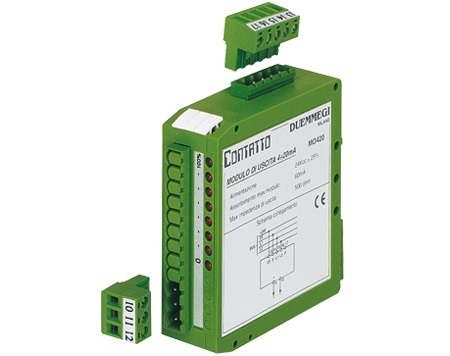 ModDI module also features protection against overcurrent, overvoltage, short circuit and overtemperature. Housing: DIN 3M for rail mounting. 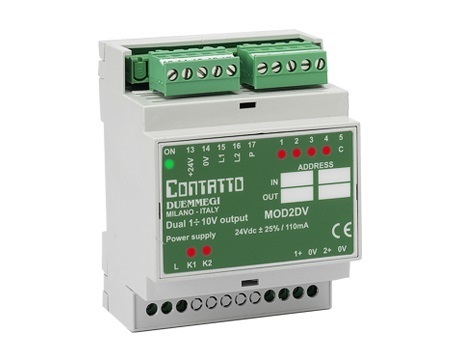 MOD4DV allows the driving, through the Contatto bus, four external dimmer with 0 - 10V input. This module can also be use as an analog output module 0 - 10V (8 bit). 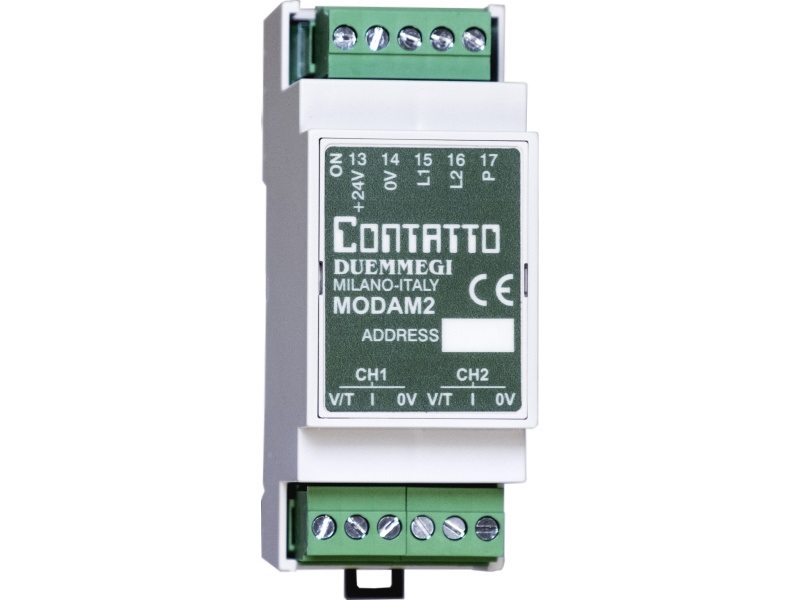 MOD2DV module allows the driving, through the Contatto bus, of two electronic ballast for the regulation of fluorescent lamps. The module provides 4 inputs that may be used for local commands of the module itself or as generic inputs of the system. 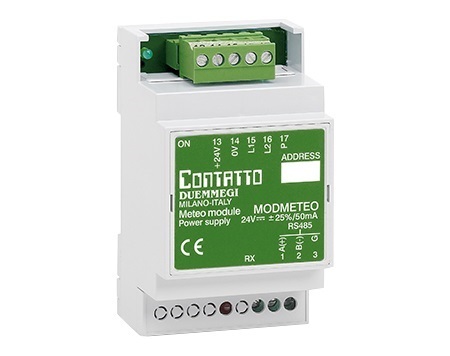 MOD2DM module allows the regulation, through the Contatto bus, of two resistive loads such as incandescent and halogen lamps (with or without transformer). The module provides 4 inputs that may be used for local commands of the module itself or as generic inputs of the system. 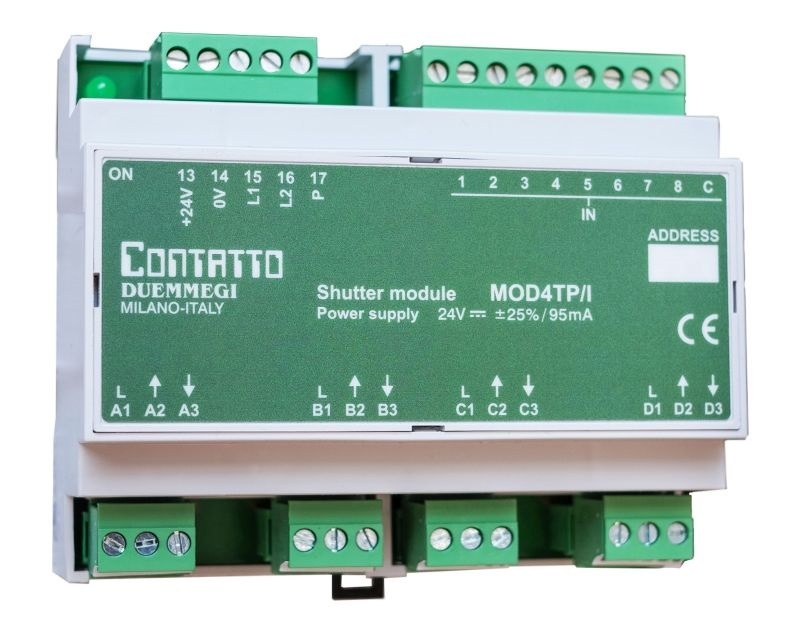 Mod4TP/I module controls 4 independent 230Vac motors with double winding for moving blinds, roller shutters and similar devices through the Contatto bus. 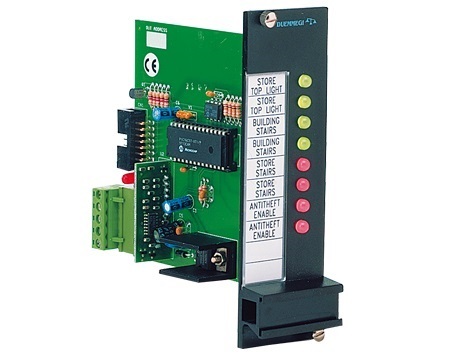 The travel times from the fully open to fully closed position and vice versa are measured and stored automatically by the module. The measurement of the travel time allows extended features of precise positioning of the roller shutter to any intermediate value between 0 and 100%. The output contacts for each motor feature an electromechanic interlock in order to avoid damages to the motors themselves and to the module. 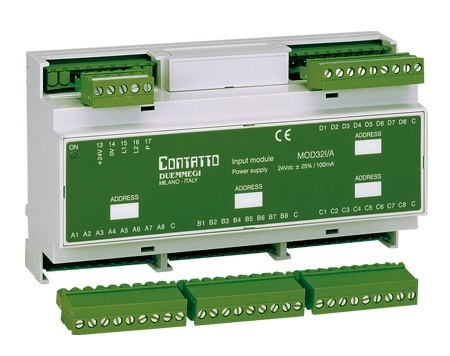 Mod4TP/I module also provides 8 generic digital inputs for connection of potential-free contacts (buttons, switches or other). 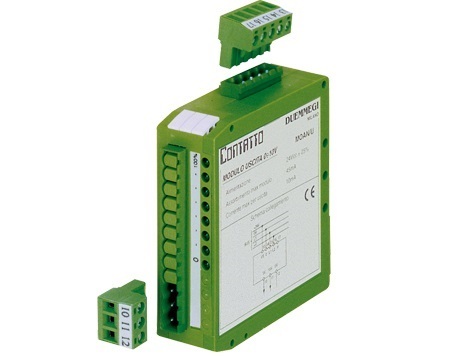 MOD4-4S module provides 4 inputs and 4 relay outputs for driving loads like lamps. shutter motors, etc. 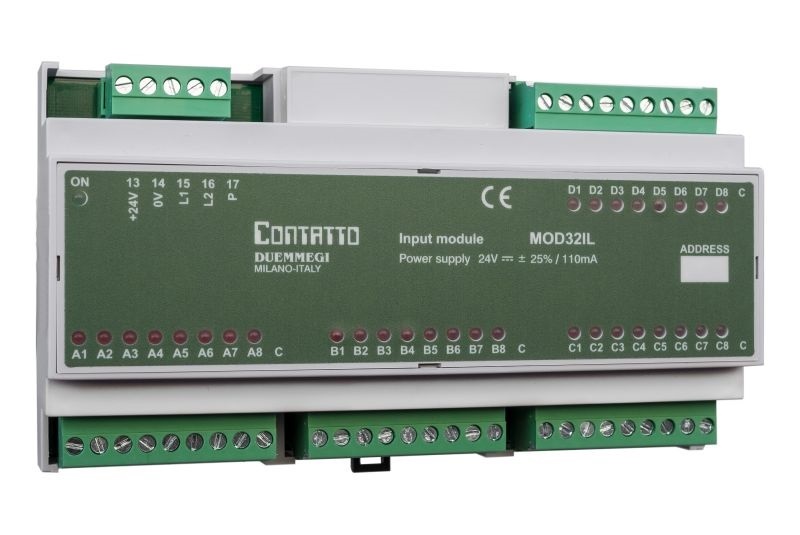 MOD2-2R modules allow to group in a single box 2 inputs and 2 relay outputs (1 changeover contact each one). Card with 4 pushbuttons and 4 bi-color leds. 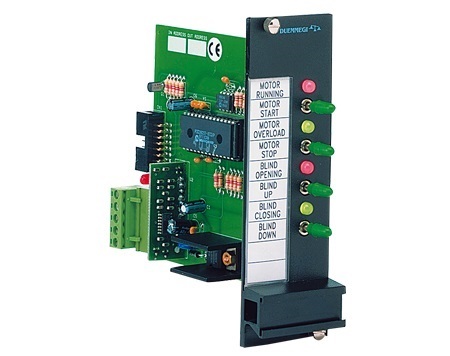 SC2800 Card with 8 lever pushbuttons. Card with 8 lever switches. Card with 4 lever switches and 4 bi-color leds. Card with 2 1-0-2 lever switches and 4 leds. Card with 2 1-0-2 rotary switches and 4 leds. Card with 1 lever switches and 4 bi-color leds. Card with eight bi-color leds. SC00AC card operates in a way similar to ISA-M sequence. 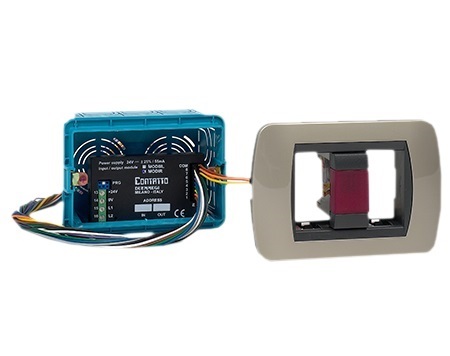 MODRHT module detects and transmits, over the Contatto bus, the relative humidity and the ambient temperature measured by a special sensor inside the module itself. In addition, MODRHT module calculates the dew point. New version performing 2 ON-OFF inputs. ModLC module allows to transmit, over the Contatto bus, the ambient brightness; in addition, this module provides a PID algorithm for the automatic regulation of the ambient brightness and some SMART modes allowing to considerably simplify the programming of the MCP (MCP version: XT or later versions) controller when realizing these kinds of applications. 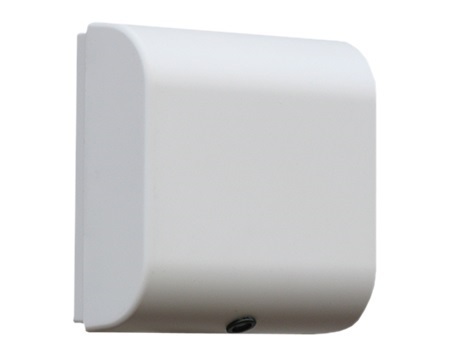 ModLC-P version also features a built-in occupancy sensor. 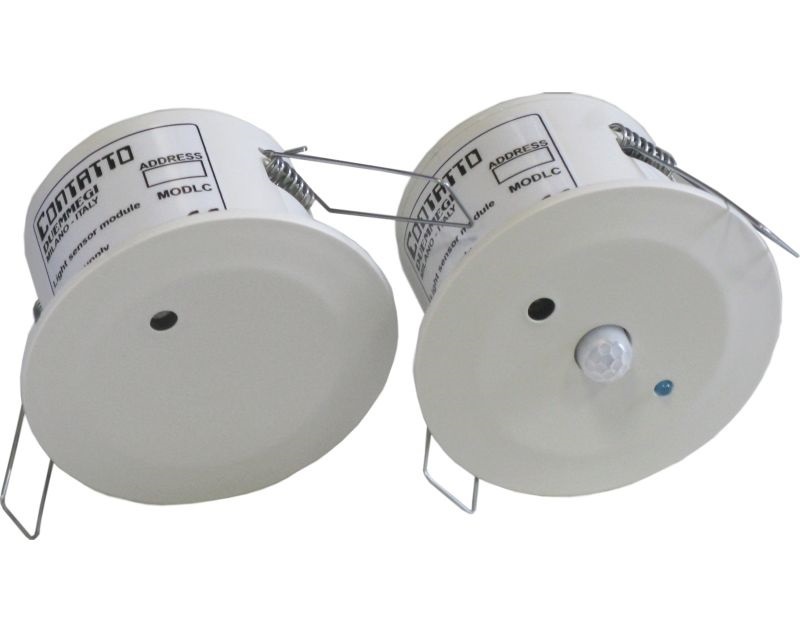 The module also provides two generic digital inputs (ON/OFF with NO/NC setting) for connecting the local command pushbuttons; one of these inputs can be set for connecting one or more occupancy sensors that, for -P version, will operate in parallel to the internal sensor. ModLC module can thus be well applied in the brightness regulation of offices, stores and open spaces, allowing to develop applications complying with the new European norms about the energetic classification of the plants (European Norm EN 15232). 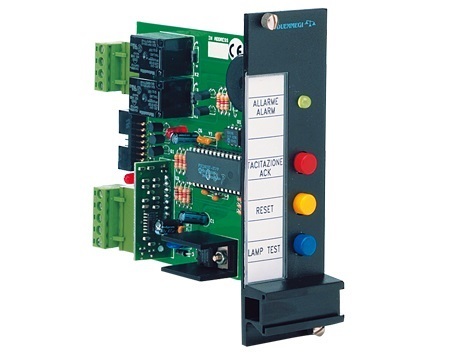 ModLC module allows to transmit, over the Contatto bus, the ambient brightness; in addition, this module provides a PID algorithm for the automatic regulation of the ambient brightness and some SMART modes allowing to considerably simplify the programming of the MCP XT controller when realizing these kinds of applications. 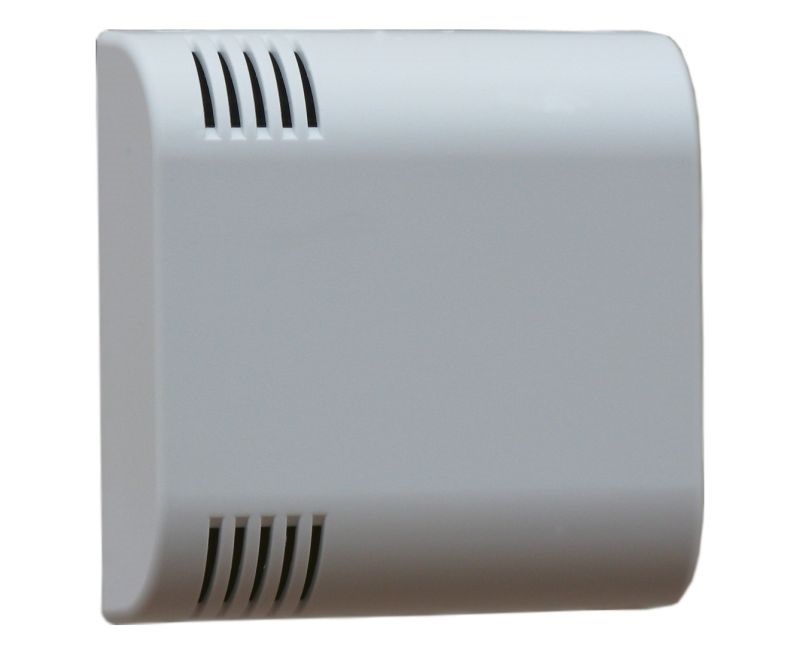 ModLC-P version also features a built-in occupancy sensor. 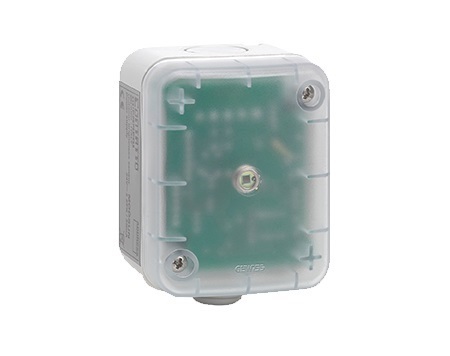 The module also provides a digital input for the connection of one or more presence sensors (e.g. 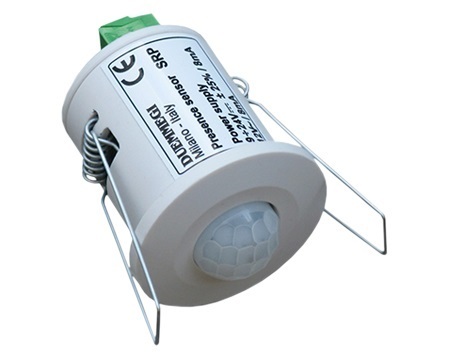 SRP) or other generic contact; for -P version, this input is dedicated to the connection, if required, of additional external occupancy sensors that must operate together to the internal sensor. ModLC module can thus be well applied in the brightness regulation of offices, stores and open spaces, allowing to develop applications complying with the new European norms about the energetic classification of the plants (European Norm EN 15232). ModLC-WM module allows to transmit, over the Contatto bus, the ambient brightness; in addition, this module provides a PID algorithm for the automatic regulation of the ambient brightness and some SMART modes allowing to considerably simplify the programming of the MCP XT controller when realizing these kinds of applications. The module also provides a digital input for the connection of one or more presence sensors (e.g. SRP) or other generic contact. ModLC-WM module can thus be well applied in the brightness regulation of offices, stores and open spaces, allowing to develop applications complying with the new European norms about the energetic classification of the plants (European Norm EN 15232). Wall mounting version. ModLC-WM-P module allows to transmit, over the Contatto bus, the ambient brightness; in addition, this module provides a PID algorithm for the automatic regulation of the ambient brightness and some SMART modes allowing to considerably simplify the programming of the MCP XT controller when realizing these kinds of applications. This module features a built-in presence sensor. 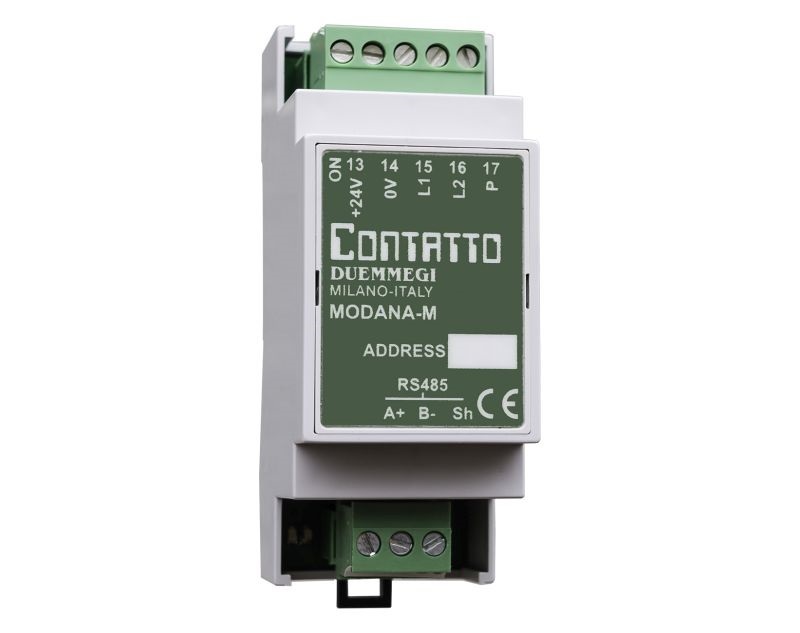 ModLC-WM-P module can thus be well applied in the brightness regulation of offices, stores and open spaces, allowing to develop applications complying with the new European norms about the energetic classification of the plants (European Norm EN 15232). Wall mounting version. ModMETEO module allows the detection of several meteorological data. 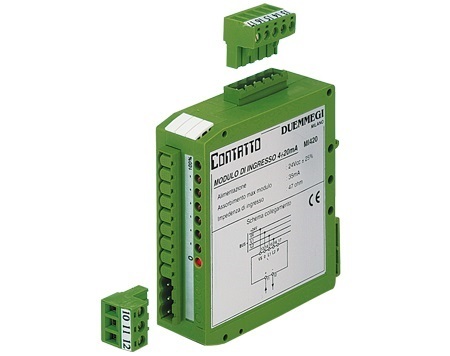 The module interfaces, on one side, to the Contatto bus and, on the other side, to a special sensor trough a dedicated communication line. The detected parameters are: Temperature, Daylight, Wind speed, Rain, Twilight and light direction. ModSUN module allows to transmit, over the Contatto bus, the ambient brightness value detected by a sensor inside the module itself. ModSUN module can be well applied for the brightness regulation for external or internal applications in industrial plants. 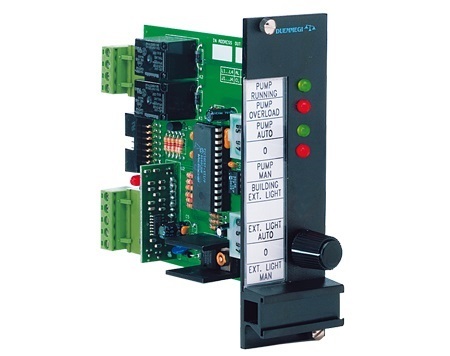 SRP module is a presence detector compatible with both Domino bus and Contatto bus. It allows to develop applications that respect the new European norms for the energetic classification of the plants (European Standard EN 15232). 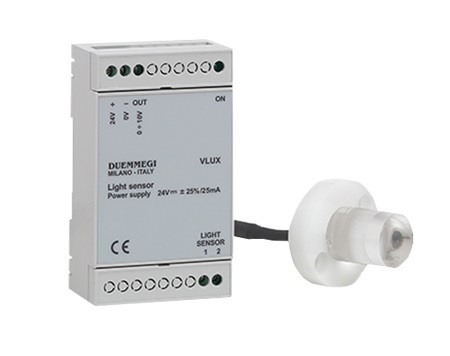 VLUX module allows to measure the ambient brightness value detected by a sensor provided together the module. The output of VLUX module is a 0÷10V analog voltage. Webcon is a web based supervisor system for buildings and homes that integrates standard automation systems and allows their control and management. Webcon consists of a hardware and a software license which are different depending on the need. 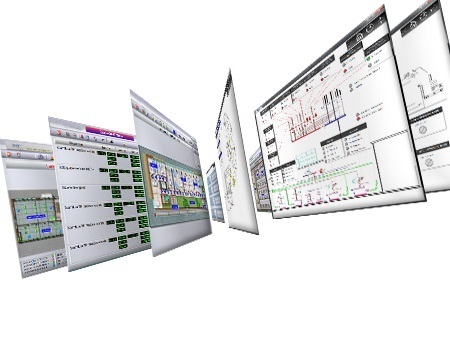 HMI/SCADA Different Scada software and HMI visualization tool, easy-to-use and extremely powerful, worldwide employed for visualize, control and supervision any automation application are available . 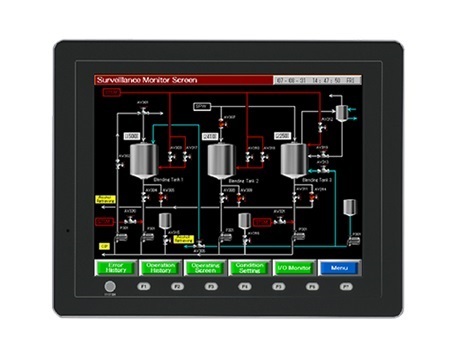 All the Scada/HMI needs are ready-to-use and all the I/O drivers are free included within the package. 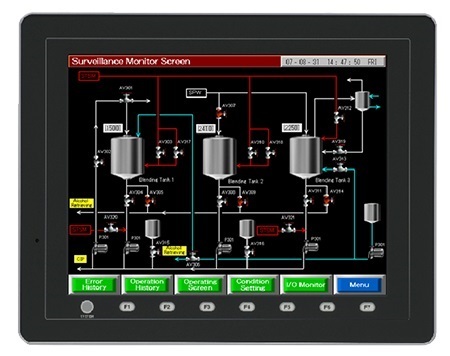 The Scada/HMI software is employed for visualization and process control, offering outstanding ease of use. 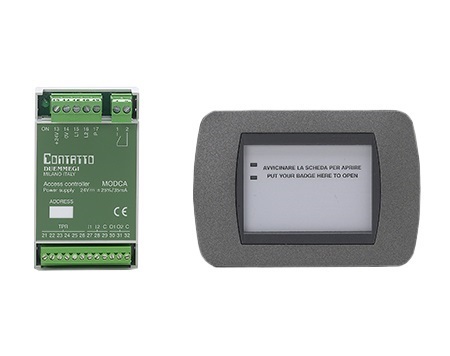 ModCL is a smart module that has been specially developed for the management of the ambient temperature, both for domestic appliance and for offices in building automation. 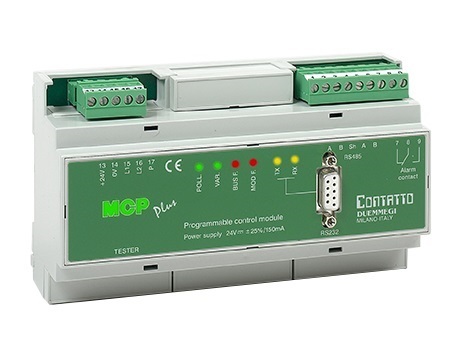 ModCL module interfaces, through MCP XT controller, to the well tested Contatto world and it is goes to integrate the many features offered by the system with an easy to use temperature regulation device. 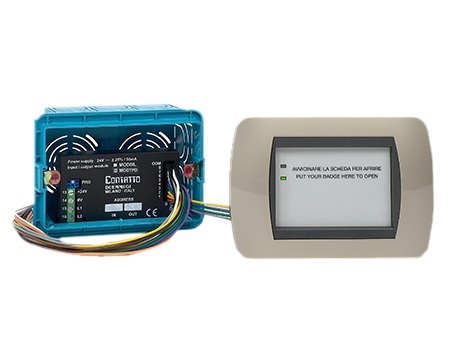 Clima2 is a smart module that has been specially developed for the management of the ambient temperature, both for domestic appliance and for offices in building automation. 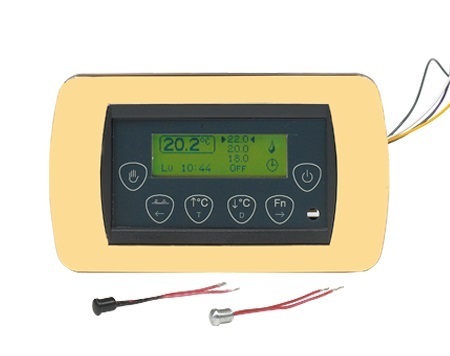 Clima2 module interfaces, through MCP XT controller, to the well tested Contatto world and it is goes to integrate the many features offered by the system with an easy to use temperature regulation device. 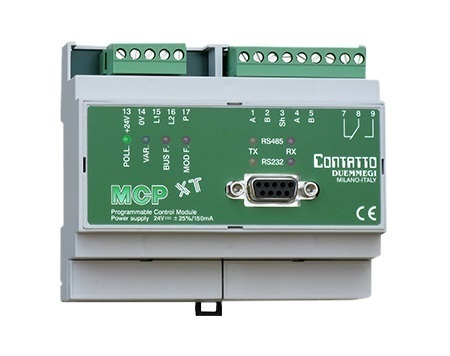 MCP 4 enhances the previous controller MCP XT with new features and increased speed. It allows to manage the Contatto system by equations and high level programs. 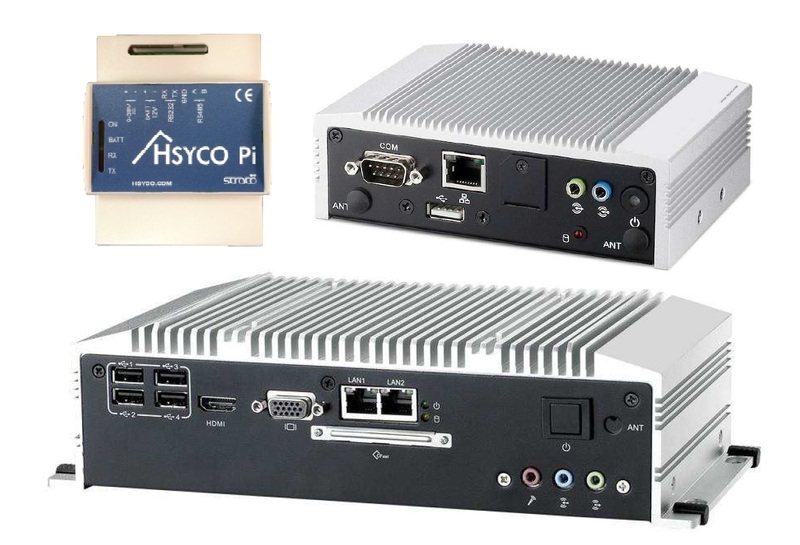 It provides one RS232 and two RS485 communications ports, one Ethernet port, proprietary protocol and standard protocols MODBUS RTU (both Master and Slave) MODBUS TCP/IP, and an additional dedicated port for the connection to WEBS module. New features include an integrated and customizable WEB Server, and a Scheduler for managing clock-activated outputs. DISP 2 BUS displays allows to show custom messages in many applications, such as industrial and domestic plants, hospital, electrical machines, etc.. Thanks to the flexibility of this device, the displays of DISPBUS make easy to understand any information related to the occurrence of alarms or events and can be installed in any point of the bus line. 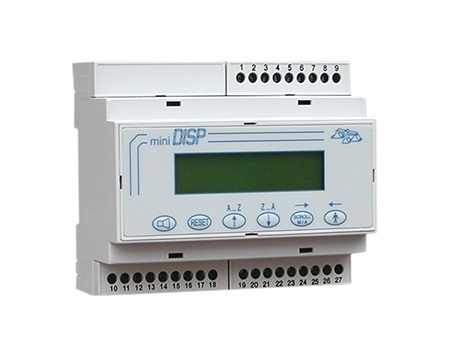 Mini DISP2 BUS displays allows to show custom messages in many applications, such as industrial and domestic plants, hospital, electrical machines, etc.. 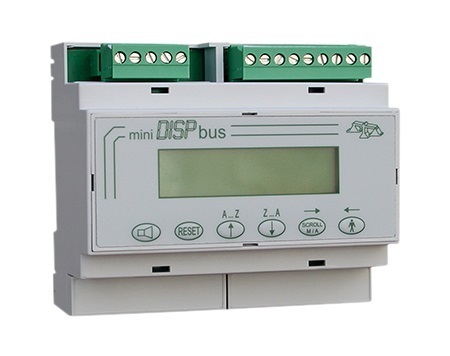 Thanks to the flexibility of this device, the displays of DISPBUS make easy to understand any information related to the occurrence of alarms or events and can be installed in any point of the bus line. Housed in 6M modular DIN box. 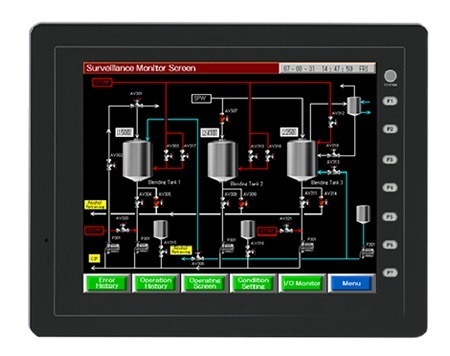 DISP 2 - displays allows to show custom messages in many applications, such as industrial and domestic plants, hospital, electrical machines, etc.. The Display can schow from 16 messages driven by direct inputs up to 255 messages driven by binary - coded inputs. 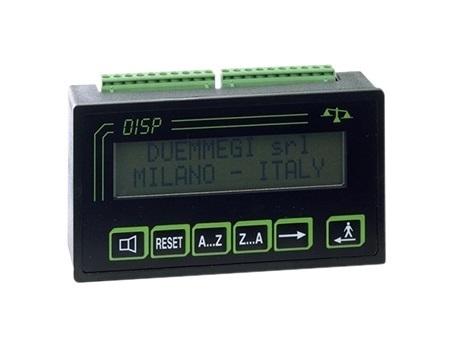 Mini DISP 2 displays allows to show custom messages in many applications, such as industrial and domestic plants, hospital, electrical machines, etc.. The Display can schow from 16 messages driven by direct inputs up to 255 messages driven by binary - coded inputs. Housed in 6M modular DIN box. 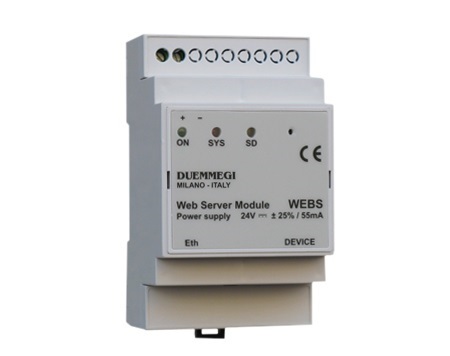 WEBS module has been developed to be used in all applications with Contatto or Domino system where it is required to control the system through an Internet connection, without complicate configuration procedures. 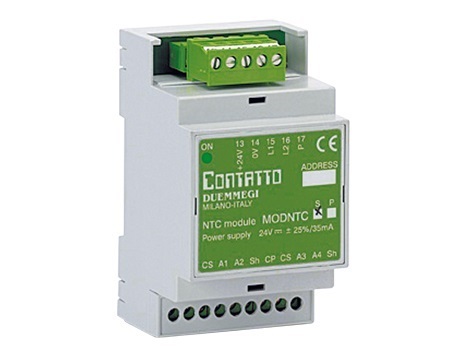 MODNTC module allows to transmit, through the Contatto bus, four temperature values measured by proper NTC sensors. 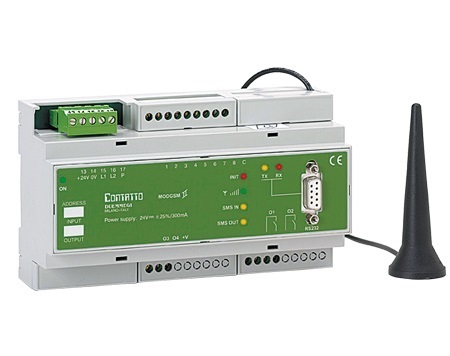 MOD2PT module allows to transmit, through the Contatto bus, one or two temperature measurements from one or two standard PT100 probes (not provided). 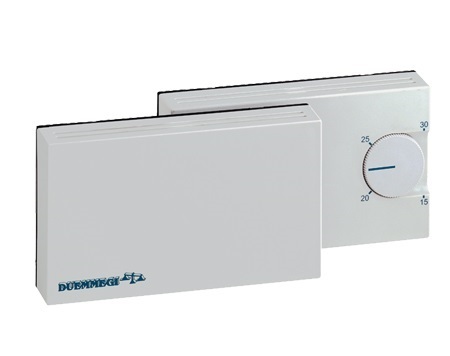 CLIMA input module allows transmitting and regulate the room temperature through the Contatto bus system; this module performs both a thermostat and ambient temperature transducer function. 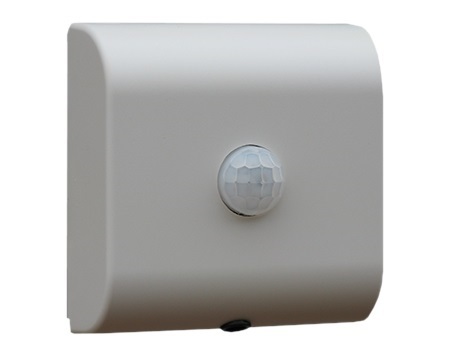 ModLUX module allows to transmit, over the Contatto bus, the ambient brightness value detected by a provided sensor. 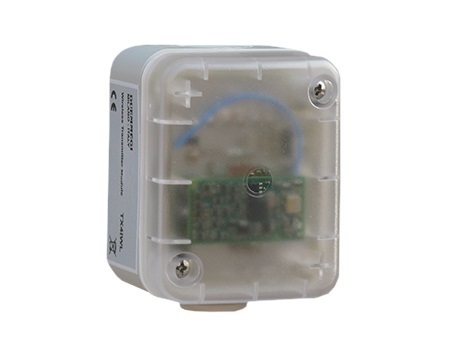 TX4IWL is a wireless battery-powered transmitter module, compatible both with Domino and Contatto bus, and it uses the ENOCEAN wireless technology. 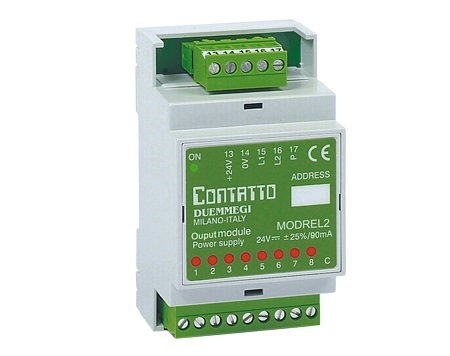 MOD32I/A modules allow to transmit, through the Contatto bus, 32 ON-OFF signals derived, e.g., from push-buttons, limit switches, proximity switches, etc. 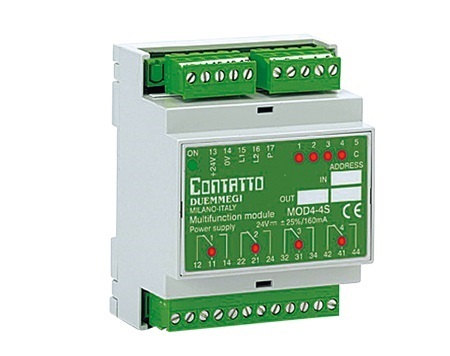 MOD4I/A modules allow to transmit, through the Contatto bus, 4 ON-OFF signals derived, e.g., from push-buttons, limit switches, proximity switches, etc. 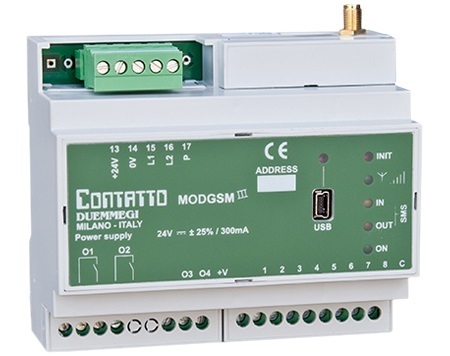 MODGSM module allows to receive information from Contatto bus and to send commands using a standard GSM portable phone. The system was specifically developed for access control managed by the new enhanced controller MCP XT. The system CA features a ModTPD module( which can be placed in standard 503 wall box) and a transponder reading unit TPR/T (with the related panel that can be mounted on the frame for 503 box of the preferred manufacturer). 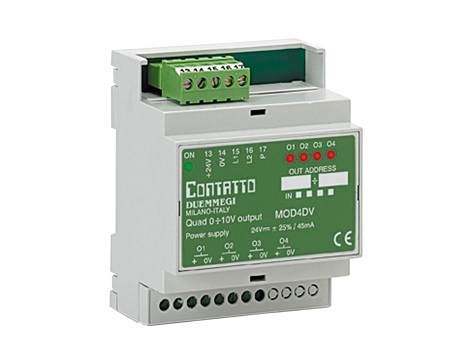 ModANA module allows the detection electrical variables of a three-phase and single-phase network. 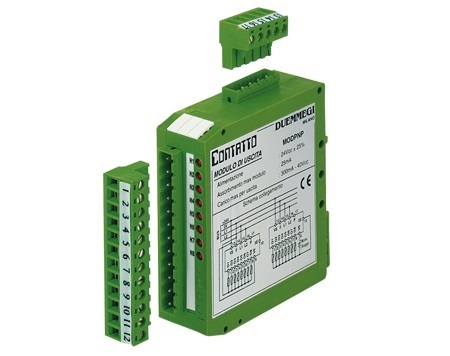 The module interfaces directly to the Contatto bus, thus making the measurements immediately available and easy to use. The measurements are also showed on the front panel by a back-lighted LCD display. 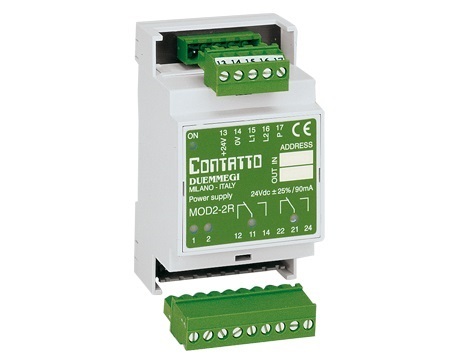 Mod32IN modules allow to transmit, through the Contatto bus, 32 ON-OFF signals derived, e.g., from push-buttons, limit switches, proximity switches, etc. Il modulo di ingresso MODINP2A/C consente di trasmettere a distanza, attraverso il bus CONTATTO, 8 segnali di tipo ON-OFF normalmente aperti o chiusi prelevati, ad esempio, da pulsanti, finecorsa, prossimetri, ecc. 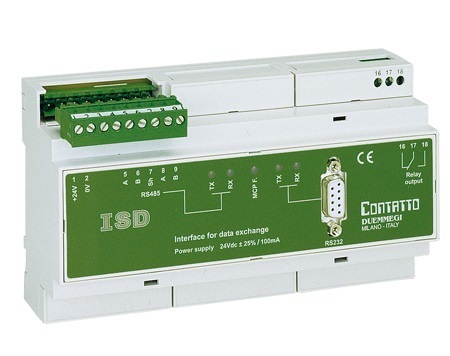 ISD module allows the handling and the exchange of informations between more MCPs (up to 31), each one having its field bus, connected together and to ISD in a RS485 network. 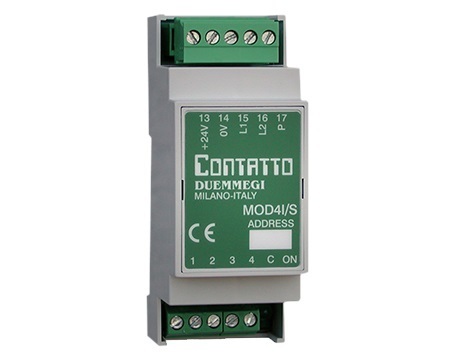 MOD4AM12/V/I analog input module allows transmitting up to four analog signals (12-bit digital code) through the bus system. There are two different version : 0 -10V and 4 -20mA or 0 -21mA. 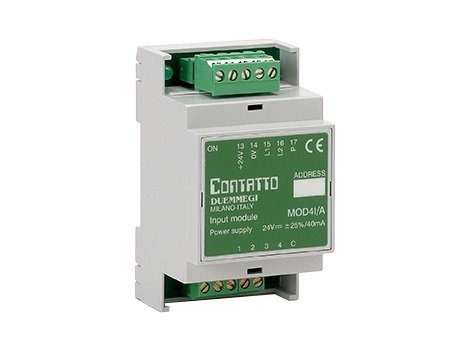 MOAN/I-I4 modules allow transmitting 1 or 4 analog signals through the bus system. The analog signals applied to this module must be 0 ÷ 10V type. 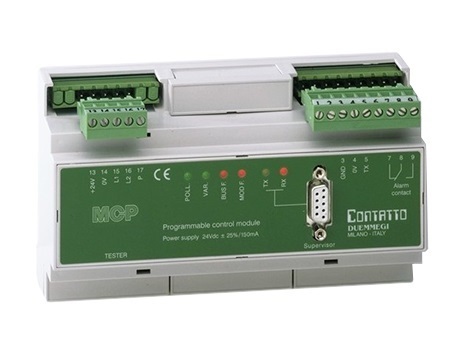 MCPMOD (Programmable Control Module) is a control module of the Contatto bus system. The handling of the system may be fully defined by the user through some rules, called equations, linking the outputs to the inputs. To make easy the development of the programs and the setup of the system, a software tool is provided. 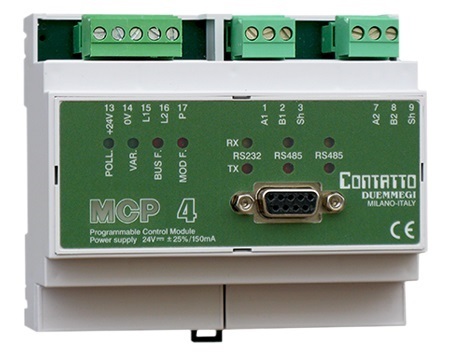 MCP-Plus compared with MCPMOD is fitted with a serial RS485 port to connect more unit in multi-drop network. 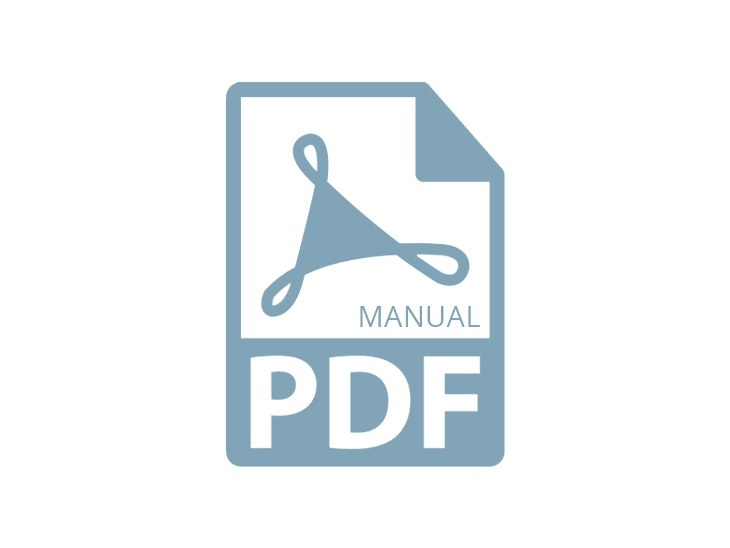 Beside to MCP standard protocol (named FXP) , MODBUS and JOHNSON CONTROL protocol have been added, avoiding the connection of external protocol converters. MODIR module allows to receive from an infrared remote control up to 255 independent channels and to send them on the Contatto bus for command execution. 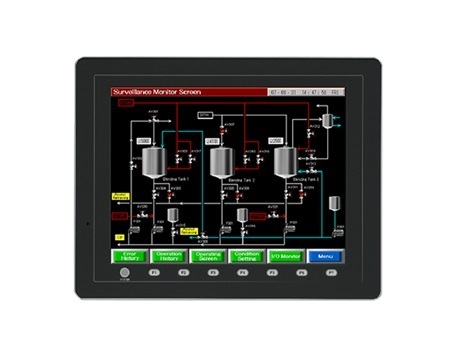 The controller MCP XT allows to manage the Contatto system by equations and high level programs. 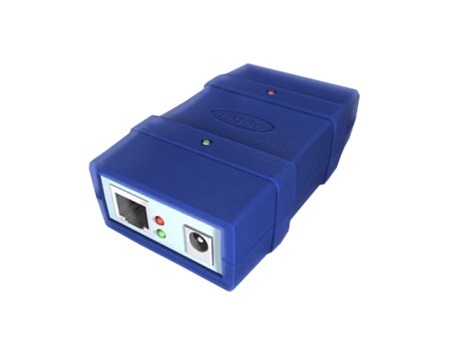 It provides 2 independent communication ports RS232 and RS485 with proprietary protocol and standard MODBUS RTU protocol, and an additional dedicated port for the connection to WEBS module. 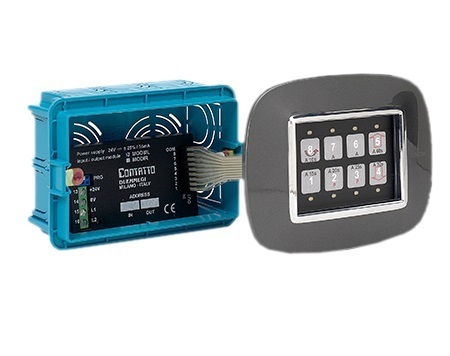 WEBS module has been developed to be used in all applications with Contatto system where it is required to control the system through an Internet connection, without complicate configuration procedures. 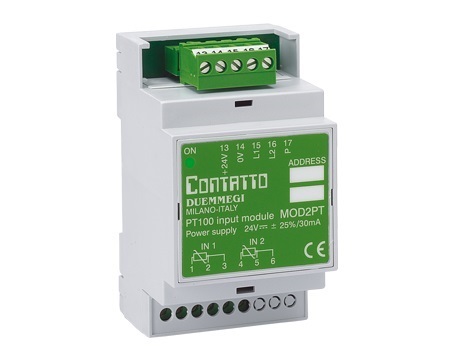 MODPNP modules allow to transmit, through the Contatto bus, 8 ON-OFF signals to drive of relays, small lamps, LEDs, etc. 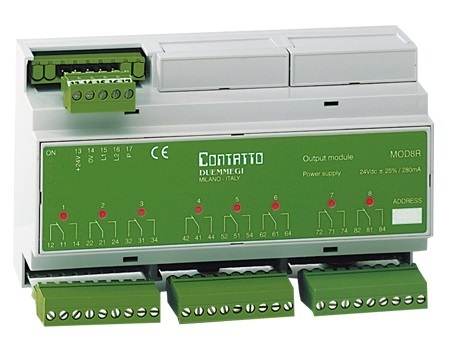 MOD4-4 modules allow to group in a single box 4 inputs and 4 PNP open collector outputs.